VERONA, NEW YORK -Turning Stone resort and online casino in Verona, New York was treated to a historic sold out match-up between two of the most exciting gladiators in boxing as Lucas “La Maqina”” Matthysse (37-3, 34 KO’s) took a majority decision victory over “The Siberian Rocky” Ruslan Provodnikov (24-4, 17 KO’s) in a 12-round junior welterweight bout on the split-site doubleheader on HBO Boxing After Dark ®. Presented by Banner Promotions and Golden Boy Promotions, the action packed night showcased two athletes fighting in the prime of their careers, with a title shot in the 140-pound division likely hanging in the horizon. Provodnikov was cut badly in round two from an accidental headbutt. 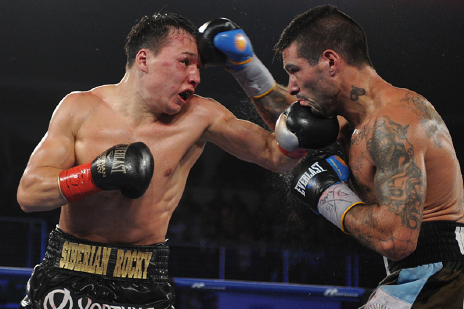 Matthysse targeted the eye but Provodnikov walked through every shot. Provodnikov came back later in the round with some solid combinations and landed some furious shots to Matthysse’s head. Matthysse had a nice bounce back round five as he landed some hard jabs to the face of an oncoming Provodnikov. The war continued through the middle rounds as both fighters went toe to toe while Matthysse landed combinations from distance and Provodnikov went on the defense and continued to brawl. Provodikov had a strong round eleven as he landed a hard left to the top of the head that buckled Matthysse and the Argentinian was forced to hold on. The two waged a final flurry in round twelve and it was Matthysse the former WBC champion won via majority decision with scores of 115-113 twice and 114-114. Going on before the live split-site HBO Boxing After Dark doubleheader, Patrick Teixeira (25-0, 21 KOs) of Santa Catarina, Brazil faced off against Accra, Georgia’s Patrick Allotey (30-2, 24 KOs) in a scheduled 10-round middleweight bout. Both fighters came at each other aggressively in the first round in an exciting exchange of hard punches. Teixeria put an end to the fight in the second round as he delivered a devastating blow to Allotey’s body knocking him down to win the fight via knockout. Vitaly Kopylenko (25-1, 14 KO’s) won a right round unanimous decision over Lekan Byfield (6-8-2, 1 KO) in a middleweight bout. Kopylenko knocked down Byfield twice that staggered the Atlanta native into the ropes. Kopylenko cruise down the stretch of the fight to win via unanimous decision with a score of 79-72. “I hurt my shoulder in the first round but I was able to gut it out and land some good shots,” said Kopylenko. Washington, D.C standout, Lamont Roach Jr. (7-0, 3KOs) faced Carolina, Puerto Rico’s Jose Miguel Castro (4-3, 2 KOs) in a scheduled six-round lightweight bout. Roach dominated the fight early on, winning the bout by unanimous decision. Vitor Jones De Oliveira (9-0, 5 KO’s) won a six round unanimous decision over Guillermo Sanchez (15-14-1, 6 KOs) in a lightweight bout. De Oiveira boxed well from the outside and countered the southpaw Sanchez nice and came home with the victory by scores of 59-55 and 58-56 twice. “It was a good fight. It took me a few rounds to get going but I am very happy with my performance and looking forward to my next fight,” said De Oliveira. Eddie “E-Boy” Gomez (18-1, 11 KOs) of The Bronx, New York started the night with a technical knockout victory over Jonathan Batista (14-6, 7 KOs) of San Pedro de Marcos, Dominican Republic, when Batista could not answer the bell to start round six in their scheduled 10-round super welterweight bout. Sidney McCow scored a first round technical knockout over Paulo Souza in a scheduled four round welterweight. McCow (3-2, 2 KO’s) of New York, NY pummeled Souza until the bout was stopped at 2:55 of round one. Souza of Somerville, Massachusetts is now 0-8. Matthysse vs. Provodnikov was a 12-round junior welterweight bout presented by Banner Promotions, Golden Boy Promotions in association with Arano Box Promotions and is sponsored by Corona Extra, Mexico, Live it To Believe It! and Khortytsa Vodka. The live HBO Boxing After Dark split-site doubleheader telecast began at 9:45 p.m. ET/PT.